No Michigan defender sacked Dwayne Haskins on Saturday. Heck, none of them even hurried the Ohio State quarterback who picked apart what was the top-ranked defense in the country. He went 20-for-31 for 396 yards and completed six touchdown passes. Even in the run game, Ohio State did damage. Mike Weber, J.K. Dobbins, Haskins and Tate Martell combined for 36 rushes for 171 yards, an average of 4.75 yards per carry. Neither Michael Jordan nor Isaiah Prince wanted to call the performance the offensive line’s best of the season, but it wouldn’t be a stretch to make that statement. However, not allowing even a single pressure while also creating holes on the ground against one of the top defenses in the nation was far from a given, and both Jordan and Prince felt good about their performances. “We spend 365 days preparing for that game, so to come out like that, so to come out like that, it means a lot,” Jordan said. Only one game remains between Ohio State and a bowl game, between the Buckeyes and a potential College Football Playoff berth. In order to beat Northwestern to win the Big Ten championship on Saturday, the offensive line needs to put together a similar performance to what it did against Michigan. This late in the season with such a tight race for the final playoff spot, style points matter. Each individual play matters more than they did at any prior point in the season. Northwestern has just 17 sacks this season, which puts them No. 114 in the country and second-worst in the Big Ten at reaching the quarterback. So, Ohio State’s offensive line won’t be facing a similarly loaded defensive front to Michigan’s. Both Prince and Jordan mentioned the motors of Northwestern’s defensive linemen and said they will make Ohio State pay for mental errors. Joe Gaviano, a 6-foot-4, 275-pound defensive end, is the only player with more than 2.5 sacks. He has six sacks and 11 tackles for loss. Ohio State must keep him contained. There's one change up from for the Buckeyes. No Demetrius Knox. The redshirt senior right guard suffered a season-ending injury on Saturday. In his place, Wyatt Davis earns his first start, and Meyer said he's "confident" he will be ready. Ryan Day nearly didn't made it to Year 2 at Ohio State. An SEC school, which has widely been reported as Mississippi State, offered him a job as head coach in the fall, Urban Meyer said. Day, however, declined the offer. Little did he know, even though he opted to remain at Ohio State, the next game he coached would be as a head coach. Day served as the Buckeyes’ acting head coach for the first three games of the season while Urban Meyer served a three-game suspension. Ohio State won all three games. Recently, though, Day’s name resurfaced as a candidate for head coaching jobs at other schools. Some thought he might have a shot at the USC job had Clay Helton not been retained, and he was linked to the North Carolina opening that has since been filled by Mack Brown. Day, though, deflected a question about job rumors on Tuesday, choosing to turn the focus of his answer to Ohio State. Day signed a three-year contract after last season and makes $1.5 million, but if the right head coaching opening pops up, it wouldn’t be a major surprise if he opted to take the next step in his career. He stayed on Meyer’s staff for a second season, but Day’s offensive acumen and his experience stepping in for Meyer early this season make him an attractive head coaching candidate. When K.J. Hill walked up to the circular table sitting on the indoor field at the Woody Hayes Athletic Center on Tuesday, it was hard not to take your eyes off his jacket. The redshirt junior H-back rocked an Ohio State jacket with military patches. There were 12 patches on his chest, one for each opponent. An oar signified Minnesota, “TUN” referenced Michigan and the Maryland state flag was sewed on to represent the Terrapins. 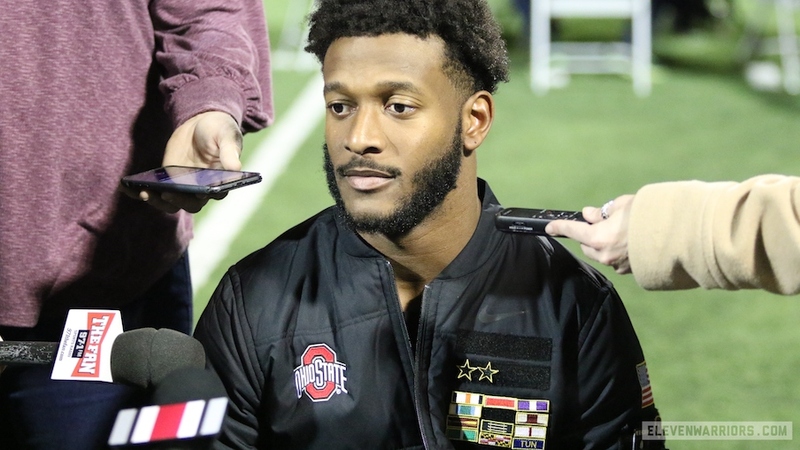 On his left shoulder, Hill had a variety of patches, each of which signified something about his contribution to Ohio State’s football program. Demario McCall was also pictured in a special teams jacket earlier this week. Based on how Drue Chrisman’s year has gone, the punter might have enough jackets to begin a collection. Maybe it’s a self-motivation tactic to ensure he plays up to his standard, or maybe it’s not. Either way, Jordan said Northwestern is most similar to – out of all the teams Ohio State has played recently – the Iowa team that beat the Buckeyes 55-24 last season. He wasn’t comparing the Wildcats’ style of play with the Hawkeyes, but rather the play-by-play intensity. So, did Meyer or Greg Studrawa originally make the comparison first to motivate the offensive line? “That's what I noticed personally,” Jordan said. All right, then. That might not be the comparison that many Ohio State supporters would prefer to hear. But unlike Iowa did last year, the Wildcats won’t be sneaking up on the Buckeyes. They’re trying to win a championship, and Northwestern is the only team standing in their way. As the saying goes, there are two sides to every story. That’s certainly applicable to Haskins and K.J. Hill both honoring Troy Smith with celebrations after touchdowns in Saturday’s game against Michigan. Haskins has his side, and Hill has his. Just like Smith did when he ran onto the field a final time at Ohio Stadium, but Hill and Haskins raised their right fists in the air, looked down and dragged their feet on the ground like they were revving up. It began with a text message to the 2006 Heisman Trophy winner. And it ended with a text message to Smith, as well.